She recently attended Coachella with Kendall Jenner, Justin Bieber and Hailey Baldwin. 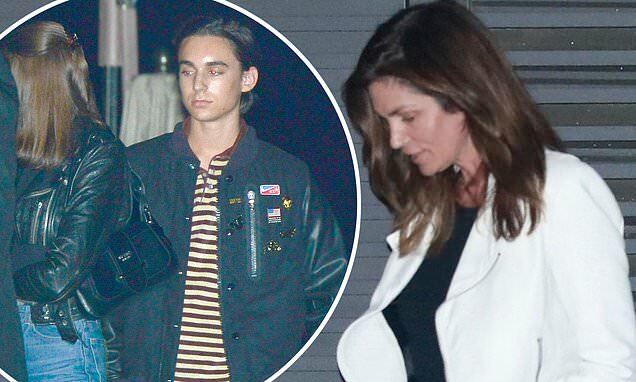 And Kaia Gerber decided to take some time out of her hectic schedule to enjoy a dinner date with her parents Cindy Crawford and Rande Gerber in Malibu, California, on Tuesday. The model, 17, cut a casual figure as she tried to keep a low profile while leaving celebrity hot spot Nobu as she was joined by a male pal. Kaia wore a pair of bleached high-waisted mom jeans which she teamed with a cropped black leather jacket and rucksack. Cindy looked effortlessly chic in a pair of washed out denim skinny jeans which she teamed with a navy top and a white cropped jacket.